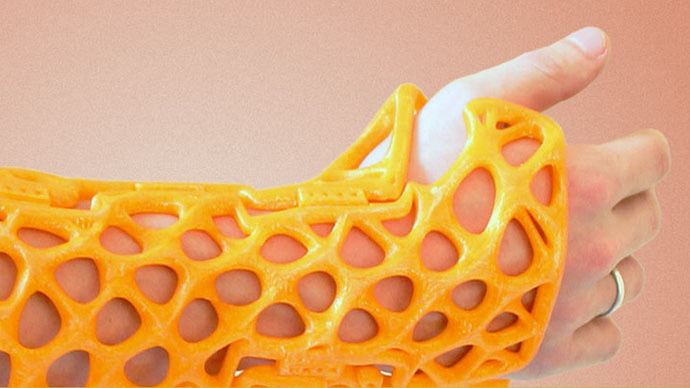 A new Russian startup has come up with way of making splints and casts for broken bones using 3D printing. The company is called Zdravprint, or Healthprint, and has received $100,000 from venture fund Maxfield Capital. The money will be used to develop the technology to replace plaster with custom-made 3D printed plastic casts and splints. The custom-made plastic pieces can be used to replace old fashioned plaster-casts in any medical procedure where a part of the body needs to be immobilized, such as a broken finger or arm. First a patient has the injured limb scanned in three dimensions. Then, a computer makes a model of the splint or cast using special plastic in a 3D printer. The plastic cast can be made in any color, and once printed all that needs to be done is for it to be heated and smoothed into shape. One of the founders of Zdravprint, Fyodor Aptekarev, told Lenta.ru he got the inspiration from a 3D printed dress designed by Francis Bitonti. As a veteran skateboarder, Aptekarev has suffered a number of broken bones, and never relishes the prospect of wearing an uncomfortable heavy plaster cast, which invariably itches. “That’s how an idea to produce a custom-made cast using a 3D printer initially emerged – to help people overcome their medical problems,” Aptekarev said. Unfortunately, a plaster cast is still needed in the first stages of repairing a break as it enables doctors to control and adjust the initial bone union. This lasts for about a week until the swelling subsides. It is only after this that the 3D-printed version can take its turn. Production of the new type of cast takes about 12 hours in terms of the actual printing, and the subsequent fitting can be compelted in less than an hour. Doctors can control the elasticity of the new casts, thus providing their patients with a lightweight, comfortable and hygienic bio-plastic alternative which is waterproof and lets the skin underneath breath. 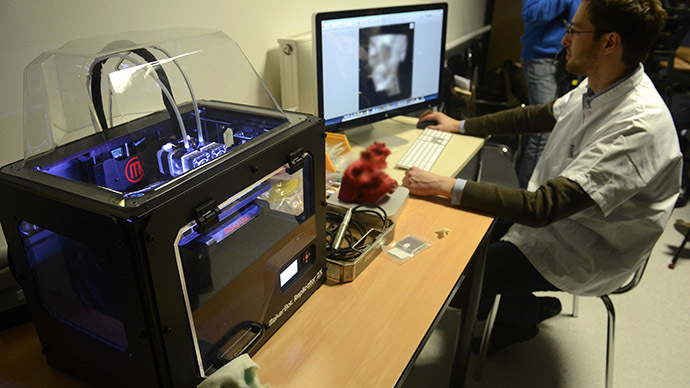 Fyodor Aptekarev predicts that within seven years, his 3D printed casts will have taken over from plaster completely. At the moment, the big drawback is the time it takes to produce each one, but he thinks that this hitch can eventually be solved. According to 3D printing consultants Wohlers Associates, Inc., additive manufacturing and 3D printing in 2014 received $3 billion of investment worldwide, and that is expected to quadruple to $12 billion by 2018. 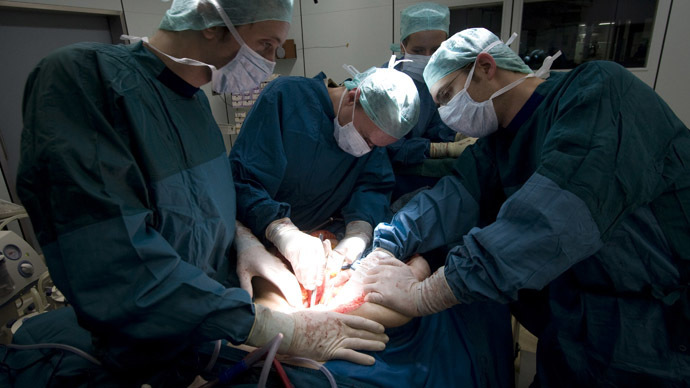 Medical applications of 3D technology are still relatively expensive. In the US there are thousands of operations being conducted annually, implanting 3D printed bones into patients, including vertebrae. 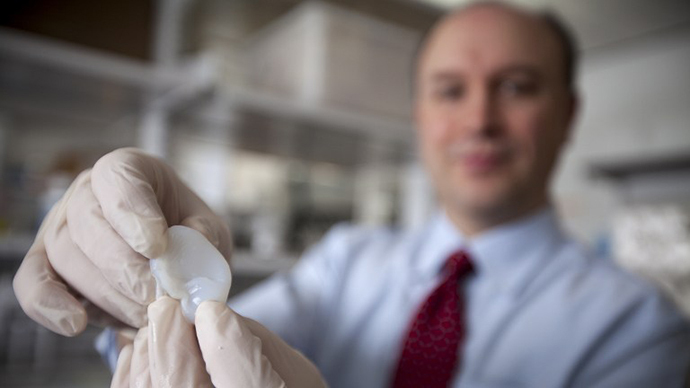 Doctors at the Sklifosovsky Clinic in Moscow have mastered the technology of printing replacement parts for broken skulls to cure major injuries. 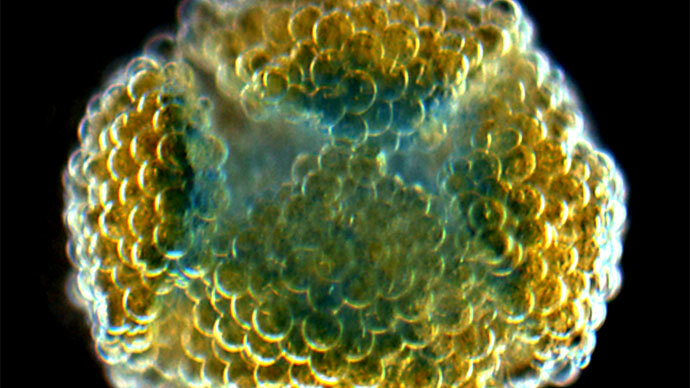 Another Russian company, Bioprinting Solutions, has developed different technology for printing biological material and is promising to present the first 3D printed human liver by 2020.